This is poem #31 in my series of poems about poems, and it is my final poem about poems for 2010. Throughout this week, I will seek a new Poetry Friday theme. Today I am excited to host fourth grade teacher Theresa Annello from the Gates Chili Central School District as she generously shares her love of poetry and her annual poetry calendar project with us. I love Christmas. I love homemade gifts, especially when they are created by children. I love young writers with their words innocent and pure. And I love poetry. Before I elaborate on these thoughts, let's rewind just a bit. My love affair with poetry started many years ago during a Children's Literature course at Hudson Valley Community College. My passion for books and poems grew even more when our children were born. Years later when I started teaching, literature and poetry became my lifelines, my "bag of tricks." However, I quickly learned that poetry was not something to save for a unit or a month in the spring. 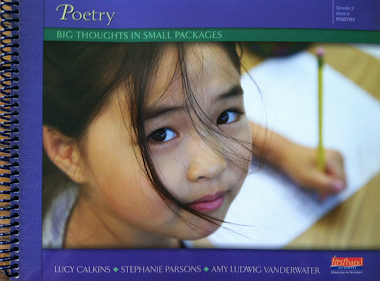 The value of poetry and the power of poetry needed a special place in the classroom culture. And heck, I needed to do something with the poems I was collecting like they were rare, vintage baseball cards. I was constantly discovering new poets or finding out that some of my favorite authors also wrote fabulous poetry. This year, I tucked a poem for each student in the envelope with my August "back to school" letter. By the end of the first day of 4th grade, each student's collection was started. Their poetry folders now contain fifty or more poems. Children are drawn to poetry for many reasons. Poems are fun to read. Poems are usually shorter pieces of text. Poems speak to your heart. Poems are fun to write. For a while we simply enjoy a wide variety of poems, building our collection, getting to know some poets before taking a closer look at this genre from a writer's stance. The generosity of writers who build their websites and actively blog has also enriched our literacy lives immensely. 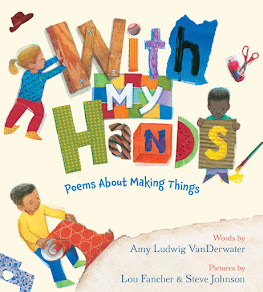 About a year ago, my poetry life got even better after attending a Saturday morning event where Amy Ludwig VanDerwater presented. Her passion and talents and the ideas I gathered that November morning continue to take me new places in my teaching and my own writing. Amy and the others I have "met" in the blogging world have solidified my belief that you will be a better teacher of writing if you also write. I would also add that writing has helped me to be more reflective about my teaching and my life in general. By now you may be asking, "How does this all relate to my love or Christmas and homemade gifts?" Several years ago as I was searching for a keepsake gift that incorporated writing, an authentic way to share and celebrate student writing. In my quest for the perfect holiday gift of writing, the poetry calendar was born. As a mom, I thought of the holiday projects our own children have created over the years. I hated tucking them away after the holidays. I love a refrigerator decorated with children's artwork and writing! A calendar would have its own special place for twelve months! By the time I introduce the calendar project, students "know" several poets, have collected some favorites and composed several of their own poems. This background and stash of poems enables us to complete the project in the short month of December. Ideally, I would start this project earlier to allow ample time for drafting, revising, and publishing. We talk about calendars, the months of the year, and possible themes for our calendars. Most students write and select seasonal poems on topics related to each month. Many poets choose to incorporate things their families are interested in or pay tribute to family members in their birthday months. for each month, I plan a mini lesson on a poetry form or the work of a particular poet that we might emulate. The following list is a sample of lesson topics including helpful internet links. Haiku - we had some fun with GUYKU. Check out the book link. Author, Bob Raczka and illustrator Peter H. Reynolds have a knack for connecting with young writers. Charles Ghigna was also one of our haiku mentors. Here is a link to his post on haiku. Color poems - Joyce Sidman's RED SINGS FROM TREETOPS continues to inspire our writing. Here is a link to her website. Poet Elaine Magliaro also taught us a lot about color poems at Wild Rose Reader. Mask poems - For these, we turned to Bobbi Katz and Elaine Magliaro. Too, poet Joyce Sidman is the perfect mentor for non-fiction poetry. Many of her books pair a poem with an informational paragraph about the living subject. Her work was a model when we wrote mask poems. Even though we did not include the informational paragraph, we referred to texts that helped us to think like the animal, plant, or object that we were pretending to be. "Things to Do If You are a Pencil" was written by a student and used for the back to school month of September. Acrostics - at The Miss Rumphius Effect, I was introduced to poet Avis Harley and her book, AFRICAN ACROSTICS. I was able to get my hands on a copy of AFRICAN ACROSTICS from our local library and must admit that I have a much improved attitude about acrostic poems, a beloved form of many students. Avis's writing elevates the form to a sophisticated level. 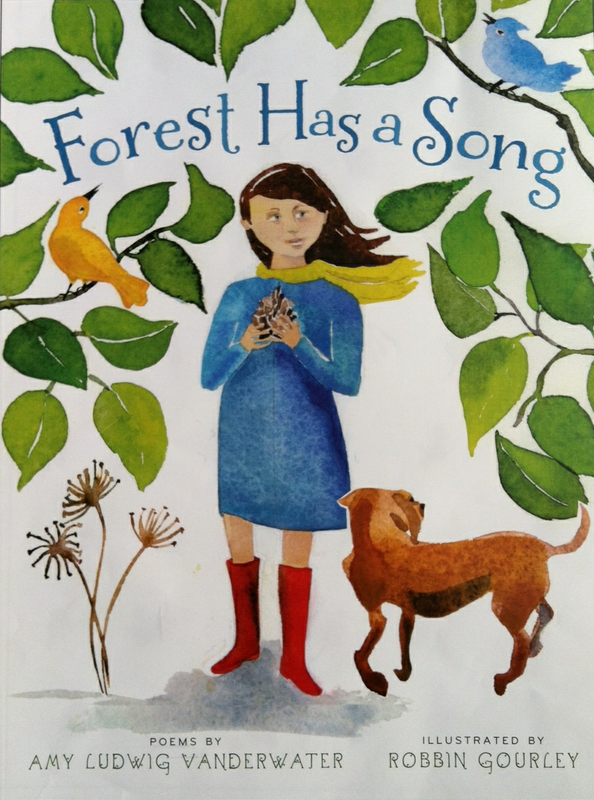 The Poem Farm - Amy's daily blog posts continue to inspire and guide our writing lives. We love her poems. Sometimes they make us laugh, other times they bring a tear to our eyes, but they always make us think more deeply about writing and the world around us. The accompanying reflections and tips for students and teachers have truly helped us to live like writers. We look closely at what works in writing - word choice, voice, the perfect comparison, the rhythm, etc. Many students love counting the syllables in each line of a poem and then try to use the same format. Students have the freedom to make choices with their calendars, but they must include eight original poems and must illustrate each month. Many are quite detailed with fancy borders of text and symbols. Each student must try the technique from the mini lesson even though it may be saved for a future writing piece. This is my fifth or sixth year doing the calendar project, and yes, it is a bit crazy...but the end product is priceless. Like so much of what we do in the classroom, this project changes and grows depending on the strengths, needs, and interests of the students. 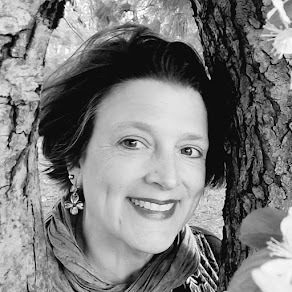 I would be remiss if I did not give credit to author extraordinaire, Shelley Harwayne, who writes about adding special events to writing workshop. Each year, I pull out her book, WRITING THROUGH CHILDHOOD: RETHINKING PROCESS AND PRODUCT. 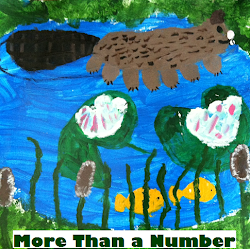 She provides a brief explanation of third graders creating non-fiction calendars on a topic of their choice. This idea still intrigues me and one of these years I would like to start the project sooner to allow for some research on a topic of interest. Completing this project in the short time of December is a bit of a whirlwind, but in my mind and heart, it is well worth it. There is something about writing, especially poetry writing, that helps create a strong classroom community. I cannot put my finger on what it is. Perhaps it's the collaborative effort, the sharing, or the pride in a completed piece of writing that sounds like a favorite poet. In the end, maybe it's that sparkle in a young writer's eyes and the appreciative nods of his or her classmates. Clearly I could talk about this forever and will tell you in advance that I always appreciate any feedback that I receive. Please let me know if you have any questions, comments, or suggestions. I will close with the words of a favorite poet, Lee Bennett Hopkins: PASS THE POETRY, PLEASE! Happy 2011! I am very grateful to Theresa Annello for sharing her generous words and links about poetry calendars. Please know that Theresa's blog, Looking for the Write Words, is inspiring for the teacher, writer, and parent in all of us. A very happy New Year to all of you, poetry friends new and old! I am grateful to have joined this community and find it strange that last year at this time, I had never heard of Poetry Friday. What on Earth will 2011 bring? Hi, Amy (love your new pic) and hello to Theresa! "flames of poems/galloping/like horses" is the standout line of this Friday's piece--can't wait to find out what you'll do with Poetry Friday in 2011. I am so excited by the Poetry Calendar project I almost wish it were November 31 instead of December 31! I'm thinking about how to adjust it for first-graders. I love the thought of a poem fire - that's exactly what poetry does: a call to gather around and enjoy the warmth! Theresa - thank you! What a great idea to tuck a poem into that welcome letter - I shall have to remember that! Happy New Year Amy! Your daily poetry is a gift I crave every day more than chocolate!! Thank you for featuring Theresa, a talented teacher and special friend. Hopefully some day I will be brave enough to join the community of writers and not be just a consumer of the fruits of your talent! Your 31st poem about poems on the 31st of December is a perfect culmination to the year and the theme. What a beautiful image of friends gathering around a campfire sharing poems and stories. Thank you for warming our souls with your words. Thank you for welcoming our class to the Poem Farm. I can't wait to share this Poetry Peek with my students on Monday! Surely they will be beaming with pride. Years ago, when I lived in New Hampshire, some dear friends of mine had a poetry reading in their family room every New Year's Eve. People really would pull their chairs around the fireplace and read poems. You make me homesick for them! How wonderful, Amy, that you finished the year having achieved your poetry resolution! So many good intentions fall to the wayside, but you can hold your harvest in your hands. Loved hearing from Theresa -- her energy and ideas are marvelous. I once mentioned making a poetry calendar on my blog, referencing Education World's lesson plan (http://www.educationworld.com/a_tech/techlp/techlp027.shtml) I'm including the link to Ed World, in case anyone wants to see their thoughts. Thank you for letting my warm my hands and heart at your poetry bonfire! Oh, poetry friends. I feel like we all did get cozy and marshmallow-y this year. Thank you again to Theresa and her students and to all of you for gathering 'round here on this last PF of 2010. I am so grateful. A. My goal for 2011 is to read your blog more faithfully. I love what you are doing here. Jone, Thank you very much. Please let me know if ever you'd like to connect directly blog-to-students. That would be fun! Happy New Year! A.